A specialist in the most challenging of jobs: at the IAA Commercial Vehicles in September in Hanover, the PALFINGER Crawler Crane PCC will celebrate its world première. The all-rounder on a crawler chassis is initially available in three variants of around 50 to 115-tons. PCC – these three letters stand for a genuine pioneering product. The PALFINGER Crawler Crane – the first PALFINGER crane mounted on a crawler chassis – offered as a holistic concept. The crawler crane achieves its full potential not only on difficult terrain and with gradients of up to 60%. Being around 40 centimeters narrower than a conventional truck, it offers new lifting potential even in confined areas where one centimeter extra can make all the difference. Thanks to the knuckle boom that can be angled upwards, the high lifting power and compact dimensions, the PALFINGER Crawler Crane PCC is also the perfect system for use in urban areas as well as in the industrial and indoor sector. The crawler allows the crane to be quickly repositioned on construction sites as and when necessary. Another advantage is that the crawler and crane can be controlled, transported and operated separately, which is particularly useful in situations where weight restrictions apply. The crane module can also propel itself on its own stabilizers without the crawler – a process also known as “shifting”, explains Hagenauer. If necessary, the PCC can also be mounted onto the transport truck. This means greater utilization and maximum flexibility with maximum power for the user. The first crane manufacturer to offer the crane and crawler from a single source, PALFINGER creates clear added value for the customer. The three modules (crawler, crane and counterweight) can be individually combined and operated optimally for a diverse array of tasks. The modules are perfectly matched, while the interfaces and functions have been thought through right down to the very last detail. For servicing, maintenance and training, one contact person has been appointed for the entire device. Initial training by factory personnel when the device is handed over and, if desired, assistance with the initial jobs, round off the service package. This, too, saves time and money. The PALFINGER Crawler Crane PCC offers impressively compact dimensions: all it needs is a clearance width of 2 to 2.2 meters and – minus the crawler – a passenger height of 2.2 to 2.5 meters. Shifting (i.e. moving the crane unit using only the stabilizer outriggers) allows the system to be moved through extremely low and confined spaces and loaded into a container without the crawler. The crawler chassis is perfect for off-road use, has high ground clearance and can climb gradients of up to 60%. When the crane is used off-road, depending on the support width, slope gradients of 8° to 20° can be levelled out thanks to the long and particularly robust support feet. This ensures ultra-high lifting capacities and universal usability, even on difficult terrain. The PALFINGER Crawler Crane PCC is available in three variants: the PCC 57.002 has a maximum reach of 29.5 meters, a maximum lifting height of 32 meters and a maximum lifting capacity of 17,900 kilograms. The slightly more powerful model, the PCC 71.002, has a reach of 31.6 meters, a maximum lifting height of 34 meters and a maximum lifting capacity of 19,100 kilograms. 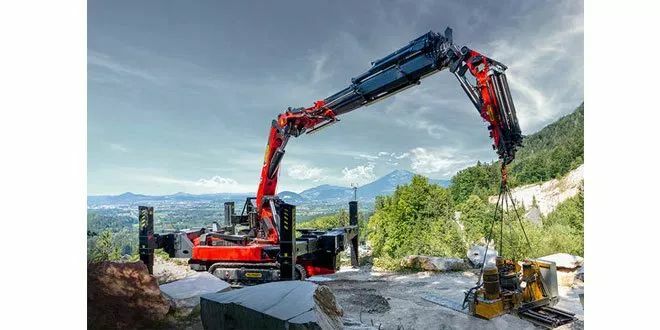 The most powerful model is the PCC 115.002, which has a reach of 33.3 meters, a maximum lifting height of 35.8 meters and a lifting capacity of up to 30,000 kilograms. Numerous pieces of additional equipment such as workman baskets, vacuum lifters, pipe manipulators and grippers are available for all models. Models PCC 71.002 and PCC 115.002 are available immediately; model PCC 57.002 will become available in spring 2019.